Scoop Daley is a reporter for the American newspaper/magazine Press Guardian. When we first meet him, his last name is spelled Daily as in daily newspaper but then it switched to Daley until the last of the five illustrated adventures where it is back the Daily. Might it be two different people? Yes, especially considering the final one which has a different vibe to it but for now let us consider them one person. That person is a newshound who has chosen for his beat the world and more specifically it seems, regions involved in war. Four of the tales depict his working assignments in occupied France, pointing out instances where the invading Germans were working hard to suppress speech and other freedoms. 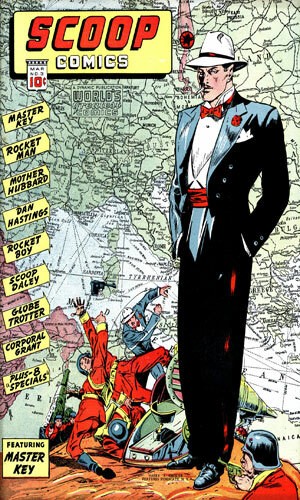 The last tale apparently comes much later, likely after the War was over and dealt more with one man's personal greed. Daley is the kind of reporter who shows that while the pen might be mightier than the sword, the fist can be pretty persuasive, too. Apparently he enjoys having his knuckles meet someone's jaw because he is leaping into such action at the turn of a head. Granted, the people he so dubs invariably are needing it but it is hard to see when he has time to write anything. Graced with a healthy head of auburn or light red hair, except in the final adventure where he is very much a blond, Daley is a handsome man and quite energetic. It would be reasonable to place his age in the late 20s or very early 30s based on his athleticism as well as his impetuousness. Daley has a way with the women as befits all good action heroes, though in one adventure when he saves a beautiful woman, she turns out to be a major player in the German occupations and who repays his gallantry by musing she might "have the Gestapo only remove your eyes and tongue". The first three adventures of Scoop Daily / Scoop Daley were, appropriately enough, printed in the pages of the new comic line Scoop Comics. Having a new magazine with the name of Scoop and having a character in that magazine with the same first name, it would not be unreasonable to expect the character to be the headliner for the publication but that was not the case. 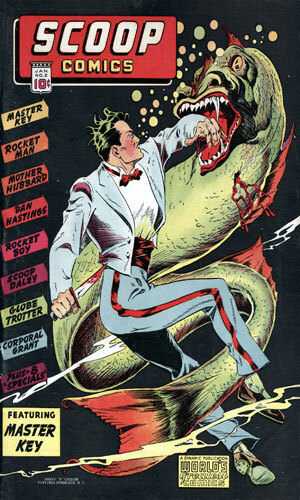 Master Key, "weird figure of the night", was the lead for all three issues. Mr Daley/Daily was stuck in the middle of each magazine. Grand Comics Database, that terrific source of a lot of the information here, indicates there were only the three issues. Comic Book Plus lists another one but with the number 8 and totally different characters and a different publisher so color me confused. As mentioned elsewhere, the first adventure of the character, his last name was spelled "Daily" like a newspaper. Afterwards, it was the homophone of "Daley". The number of items listed and the years are a tad wrong, on purpose. The short run of the comic was bi-monthly from Nov 1941 to Mar 1942 from Harry A Chesler Features Syndicate. Then the imprint went away. Apparently a couple more stories had been produced and were left hanging around because a year later the fourth adventure showed up in the second issue of another three-and-out magazine, Hello Pal though this was published by Harvey Publications. 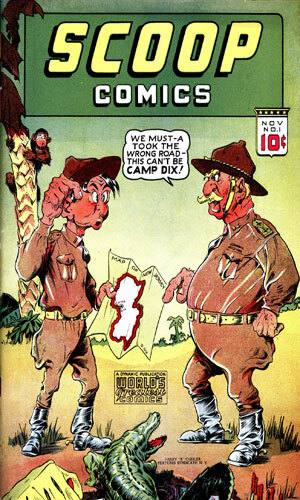 One year after that, Service Publishing Co of Chicago presented a reprint of the third adventure in the second issue of its Major Victory Comics. Normally I would just list this as a reprint and not mention it but I make note of it because in this reprint, Mr. Daley's hair has changed from auburn to black. The rest is the same. Just the hair! Finally, in April 1946, a fifth story showed up in Chesler's Punch Comics. His hair was now a vibrant blond. At least he was back in his original publisher's hands and following yet again Master Key. Note: In the late 70s in the UK, that country's branch of Marvel Comics came out with its reprints of Hulk adventures supplemented by tales of a costumed hero named Night Raven. He had a friend named Scoop Daly who showed up in several of the man's escapades but this is not the same man as the one mentioned here. Note: Titles in quotes are my poor attempt at humor used when the author gave the tale no title. From Scoop Comics #1 - Overhearing an interesting conversation between two Germans in Paris, Scoop Daily winds up with a coin the likes of which have been found on the bodies of several democracy-loving people who died a horrible death. Reprinted in Punch Comics #11 in Nov 1944 and The Weekender v1-3 in Sep 1945. 1.5 Music Soothes The Savage Beast! From Scoop Comics #1, a text story - Scoop Daily (sic) is reporting on a gathering of Arab leaders to see which side of the war they would back, English or German. The Germans have made their pitch. The English are several hours away from arriving. Daily decides to play his harmonica. From Scoop Comics #2 - Scoop Daley is frustrated that all he can report is what the authorities allow while in German-controlled France when he comes upon a Frenchman being assaulted. The dying man hands him a note and mutters a cryptic comments that gets the investigator involved in the Resistance. 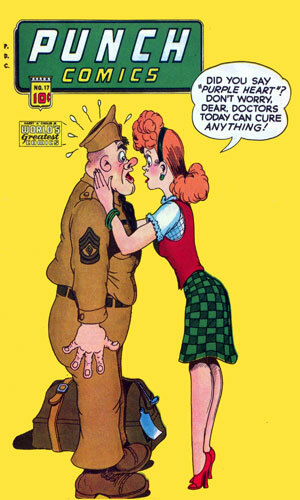 Reprinted in Major Victory Comics #1 in 1944. From Scoop Comics #3 - Having just saved a beautiful woman being accosted in a Paris cafe, Scoop Daley receives a cable telling him to learn why a scientist is returning the France and why the authorities want him so badly. The woman turns out to be a femme fatale on the other side but in love with him nevertheless. Reprinted in Major Victory Comics #2 in 1944. 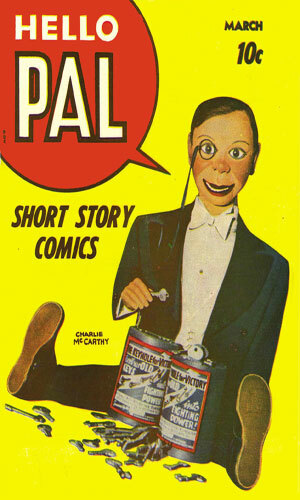 From Hello Pal #2 - Scoop Daley is curious why a Professor Gualet remains in Paris to be constantly bullied by the Gestapo. He learns the answer as he becomes yet again involved in a Resistance operations. Daley looks totally different with black hair. From Punch Comics #17 - On assignment in Mexico to cover a speech by a goodwill ambassador, Scoop Daily (back to that spelling) is there when the man is assassinated and his niece is nearly hung by the people wanting to start a war between the US and its southern neighbor. Reprinted in Triumph Comics #32 in Aug 1946 and Authentic Police Cases #3 in Jun 1948 and #7 in Apr 1950. Scoop Daley or Daily is not around long enough to get any sense of the man but the writer did a terrific job in the first four adventures showing how pretty rotten the Gestapo was in France. This is not after-the-war reporting of brutality; it is being written before the U.S. got officially involved in the fighting but had plenty of real-life reporters doing exactly what Daley was, reporting the unpleasantries first-hand. The artwork is really well done and a lot more detailed, especially with close-up facials, than was the norm for comic books in the era. Mood lighting also plays a big role giving the atmospheres a decent chance to affect the tale. There is no doubt that Daley wants to do more than just report the goings-on making him a hero more than just a spectator and making the stories filled with action. I am surprised that the series did not last very long. Did the writer/author go on to other things? I would have liked a few more adventures and I do not say that often about comic book spies from that decade.